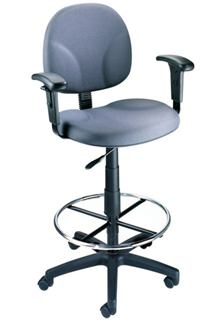 Contoured back and seat provides support and helps relieve back strain Extra large cushion seat and back with Pneumatic seat height adjustment. Available in Black, Burgundy, Grey, and Blue (as shown). Shown with optional adjustable arm rests. Overall Size: 25″W x 25″D x 41.5″ – 49.5″H.